Marine litter assessment in the Adriatic and Ionian Seas. Vlachogianni Th, Anastasopoulou K, Fortibuoni T, Ronchi F, Zeri C. IPA-Adriatic DeFishGear Project, MIO-ECSDE, HCMR and ISPRA, 2017. Marine litter is a major environmental problem for the Adriatic and Ionian Seas, according to the marine litter assessment report released by the IPA-Adriatic funded DeFishGear project. Some 33-39% of the relatively high amounts of litter found on beaches, the sea surface and the seafloor originate from shoreline sources, including poor waste management practices, tourism and recreational activities. The fisheries and aquaculture industries have their share of responsibility, with 17% of the litter found on the seafloor being mussel nets, fishing lines, fishing nets and other relevant items. The average litter density for beaches was found to be 0.67 items/m2; for coastal Adriatic waters 332 ± 749 items/km2; and for the seafloor 510 ± 517 items/km2. When comparing these results with other litter densities reported worldwide, it is evident that the Adriatic and Ionian Seas are impacted by marine litter. 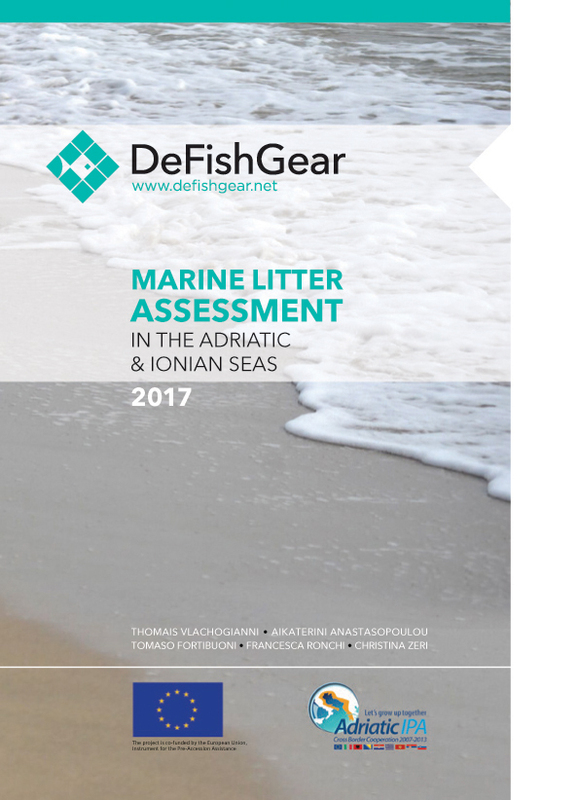 The DeFishGear marine litter assessment report presents the results of the one-year long marine litter surveys carried out in all seven countries sharing the Adriatic and Ionian Seas. More specifically: (i) 180 beach transects were surveyed in 31 locations, covering 32,200 m2 and extending over 18 km of coastline; (ii) 66 floating litter transects were conducted with small-scale vessels covering a distance of 415 km, while a total of 9,062 km were surveyed by observers on ferries; (iii) for the seafloor litter 11 locations were investigated with bottom trawl surveys and 121 hauls were performed, while 38 transects were performed in 10 locations with underwater visual surveys with scuba/snorkelling, thus covering a total area of 5.83 km2 of seafloor; (iv) for litter in biota 81 hauls were conducted and 614 fish individuals were studied. The IPA-Adriatic funded DeFishGear was a 3-year long project piloting coordinated and harmonized actions on the science-policy-society interface for litter-free Adriatic and Ionian Seas. This is the first effort to-date aiming to assess the amounts, composition and to the extent possible, the sources of marine litter in all marine matrices (beaches, sea surface, seafloor, biota) of the Adriatic and Ionian Seas. This is, in fact, the first of its kind marine litter assessment – at European and European Regional Seas level – which is based on comparable field data obtained for all marine compartments within the same timeframe, through the application of harmonized monitoring protocols, thus providing also strategic input with regards to coordinating, harmonizing and even standardizing marine litter monitoring.